There’s always a particular satisfaction you get from having a sneaky peep into places that might not technically be thought of as ‘public’. I’m not condoning trespassing – just a mild case of modernist curiosity. But if you don’t know a city like the back of your hand, how are you supposed to know what to seek out? I live and work in the City of Manchester. I publish The Modernist Magazine here for my sins. So I suppose you could say I’m a bit of a local nerd when it comes to seeking out Modernist buildings. 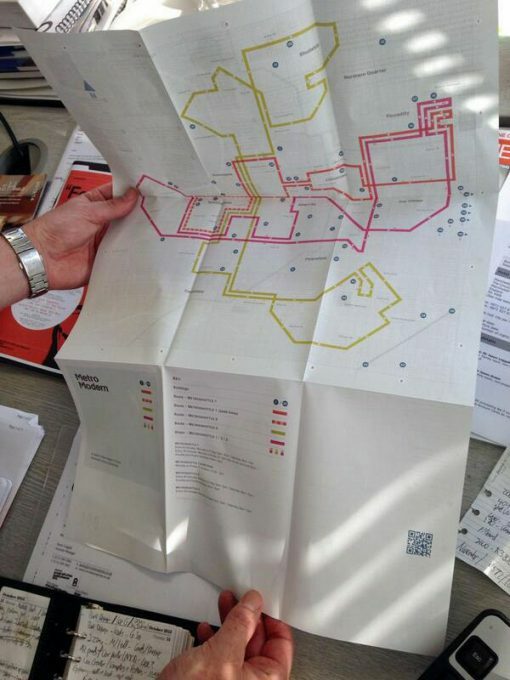 I’ve even designed a map. The PR people will sell you Manchester as home to the industrial revolution, all satanic mills and Victorian gothic but I prefer the city that was born of the welfare state and the white heat of technology, the city where the modern computer was invented, Sputnik 1 was tracked and the first NHS Hospital was opened. 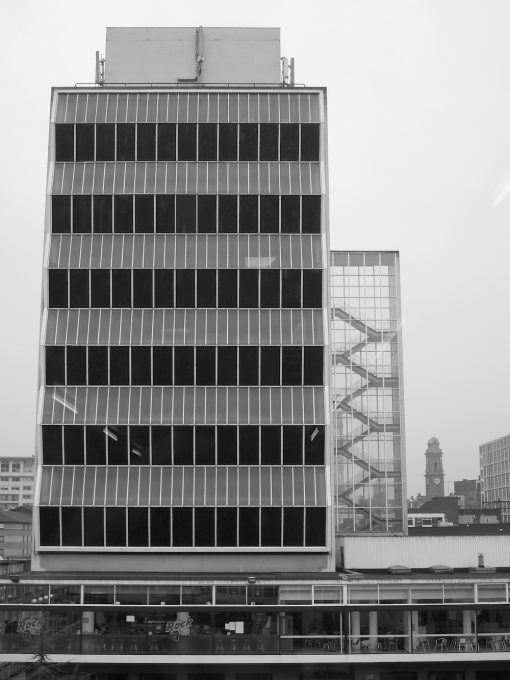 Post-war Manchester is more electrifying than its steamy industrial past. 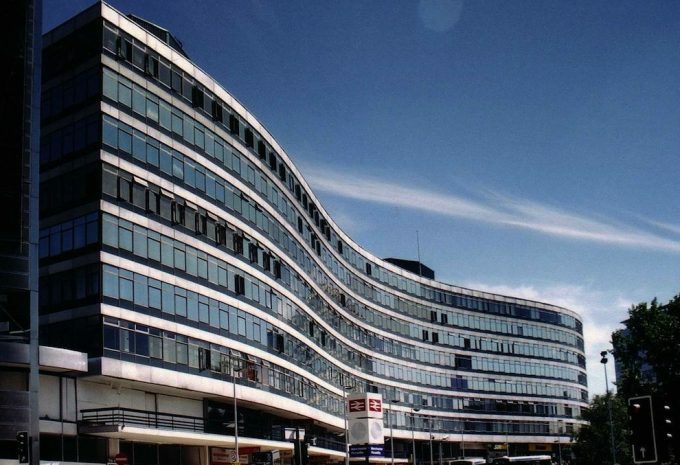 If you arrive in Manchester by rail, the very first building you’ll encounter is Richard Seifert’s 1969 Gateway House (below), a sinuous snake of glass and mosaic, currently in that shabby state before demolition or refurbishment. 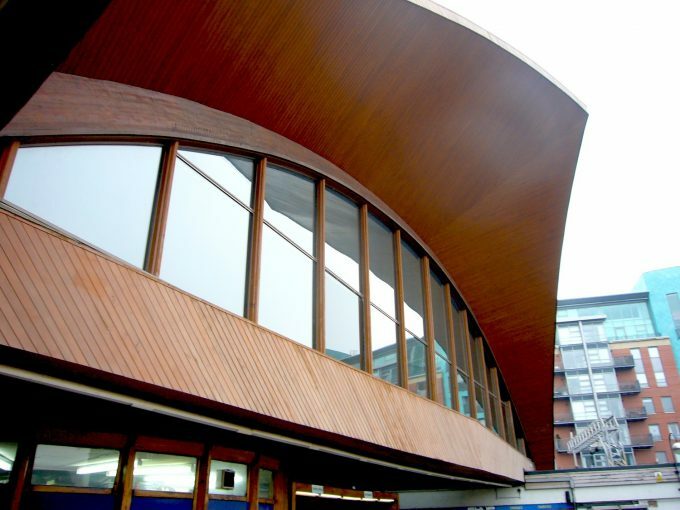 Scoot around the back and peer in through the windows for a glimpse of the fibreglass friezes and mouldings by artist William Mitchell, a prolific 1960s muralist, sculptor and experimenter who designed the gates to Liverpool’s R.C. Cathedral as well as many curious concrete totems that scatter this city. Part Easter Island / part Stonehenge, you may be interested to know that his three totems at Salford University, were recently listed. “Holloway Wall’, an experimental collaboration between the architect Harry S Fairhurst and artist Anthony Holloway, built in 1968 as an experimental sound “An original idea for an early form of LED lighting installation, rising the full height of the Tower, again by William Mitchell, wasn’t realised but if you pretend to be a guest, take a walk inside the hotel and look up into the stairwell, you will see a mural featuring birds and creatures made entirely out of off-cuts and end bits of wood. You may have seen it featured in the 1960s film ‘Charlie Bubbles’ in which Albert Finney stars with Liza Minnelli. A few years later Simon Dee, the darling of 60s British TV, drove his E-Type Jaguar surrounded by ‘dolly-birds’ up the double spiral car park ramp into the opening sequence of his ‘Dee Time’ TV show. 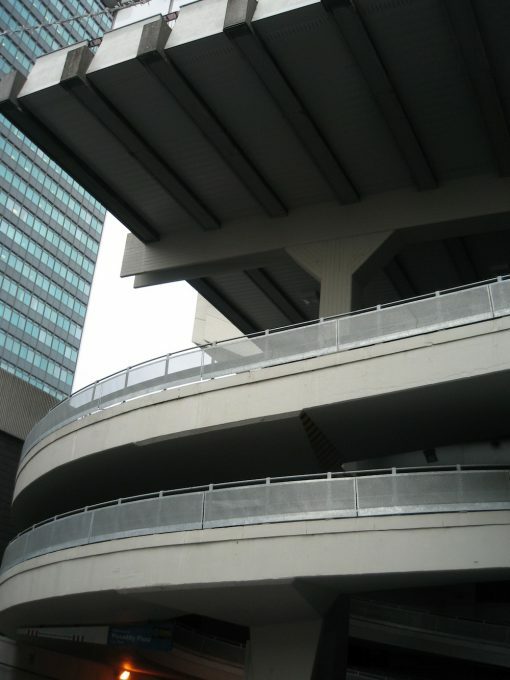 Another piece of Manchester Modernist folklore suggests that great modernist architect Louis Khan’s car broke down halfway up the Piccadilly’s ramp (above) . Luckily the van behind was occupied by an obliging Lionel Ritchie and the Commodores, who pushed Louis in his unreliable motor to the top. It’s a thrilling bit of concrete ingenuity, well worth driving up to the car park just for fun, plus you can always have a cuppa in the hotel bar and watch buses go by in Piccadilly Gardens below. Along London Road, opposite the J W Hammond’s 1973 built Macdonald Hotel (above), a slender swerve sitting on concrete stilts, is perhaps, central Manchester’s most Brutal feature, the ‘Holloway Wall’, an experimental collaborating between the architect —- Fairhurst and artist Anthony Holloway, built in 1968 as an experimental sound buffer between the dual-carriageway and UMIST, Manchester University’s Science & Technology campus. This wonderwall was recently listed. And you can see why. 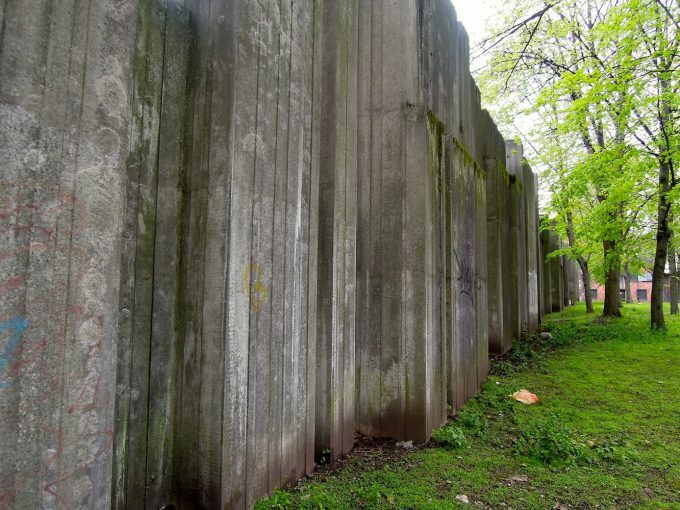 Its moss covered concrete ramparts made up of prefabricated textured panels slotted into concrete columns prove that 1960s Brutalism not only keeps out the sound of noisy traffic, it can weather well in a wet climate. Fairhurst and Holloway later worked together on the stained glass at Manchester Cathedral. 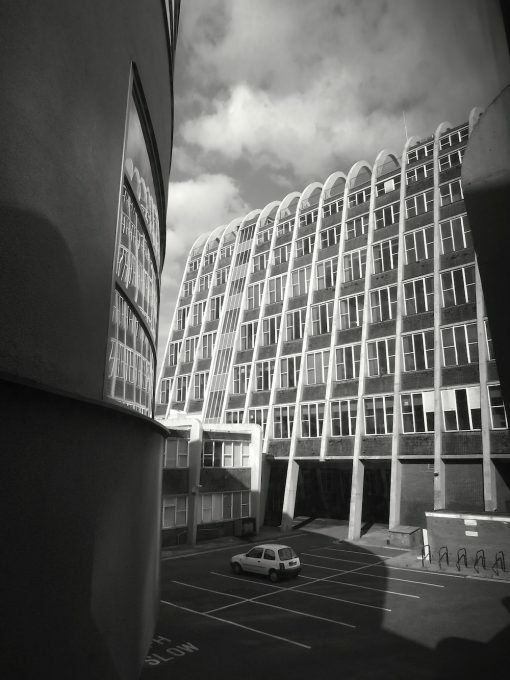 Wander around the back of wall into the UMIST campus towards possibly the best collection of 1960s buildings in the city. 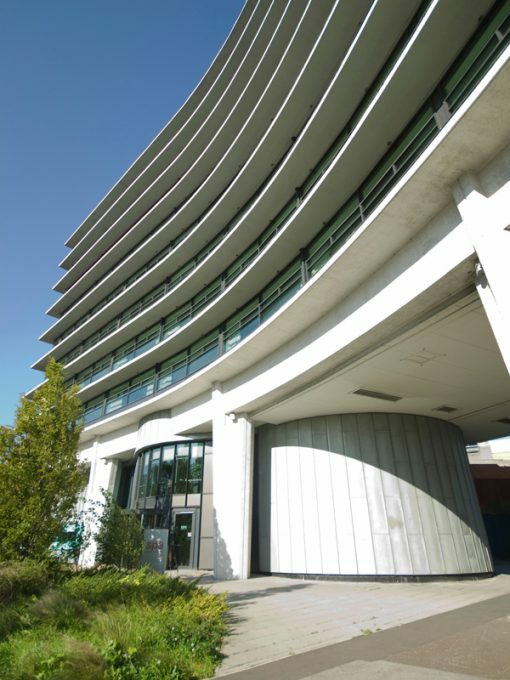 The glass stairwells and white Le Corbusian silhouettes of the Roscoe Building, Barnes Wallace Building and Renold Building, are our concrete legacy from the post war boom in education and science where carless college greens are littered with science inspired art and sculpture. Whilst photographing the ‘Insulator Family’, a sculpture made from massive ceramic electrical insulators, a passing lecturer, curious of my interest, invited me inside the ‘High Voltage Lab’ (don’t try to sneak into this one) a massive cube filled with enough fizzing globes and sparking cables to revive a thousand Frankenstein monsters. Do make your way inside the Renold Building [Cruikshank & Seward, 1962], to see the wall of the foyer which is covered in a beautiful mural by Victor Pasmore, a reminder that attitudes to commissioning art for new buildings were much healthier in the 1960s than they are today. 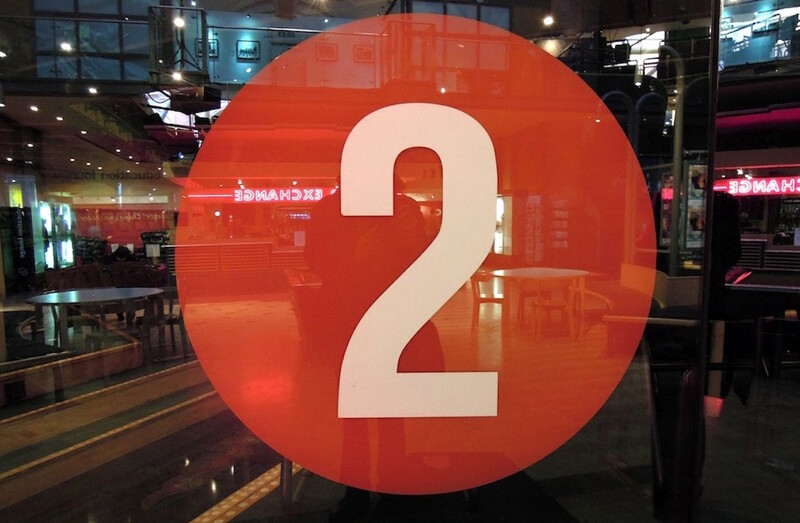 If you are feeling quizzical and fit, take the stairs to the top of the glass encased stairwell for a bird’s eye view of Manchester’s Modernist campus or have a snack in the Enigma Café, named in honour of Manchester University’s computing genius and Enigma code breaker Alan Turing. Also worth seeking out is The Alchemist’s Elements a mosaic mural by Hans Tisdall, its glittering glass tesserae adorn the entrance to Harry Fairhurst’s 1967 Chemistry Building. Do not miss the Royal Exchange in St.Ann’s Square (our main pic is from here). It may be a grand Edwardian edifice on the outside but inside, the Royal Exchange Theatre is a futuristic moon-lander built by Levitt Bernstein Associates in 1976. Tubular steel Pompidue-style pipe work supports the weight of the 700 seat theatre from the older building’s floor. It’s worth risking the wrath of the ushers and sticking your head through one of the doors to the auditorium for a glimpse at the modernist amphitheatre, and not a plush curtain in sight. 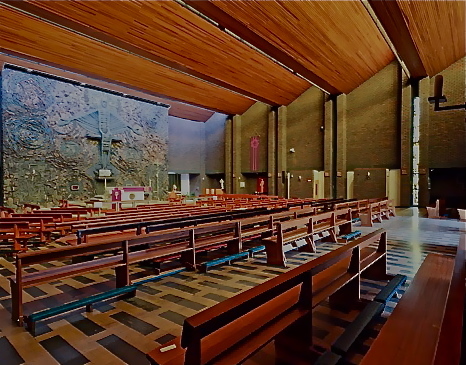 Or perhaps you need a bit of ecclesiastical modernism to wash away your sins? St. Augustine’s RC Church (above) on Grovesnor Square [Desmond Williams & Associates 1968] is a super place for a bit of sneaky contemplation. With thin slivers of dalle de verre stained glass by Pierre Fourmaintraux (look out for the Whitefriars Studios signature ‘Friar’ on a small chunk of glass embedded into the concrete) and the magnificent ‘Christ in Glory’ by Robert Brumby sculpted out of broken shards of ceramic, this is the place to bump into Father Lannon who can regale you on the difficulties of priesthood in a modernist church.. although I’m pretty sure that Victorian Churches have leaky roofs too. If all that art and contemplation has made you thirsty you might be interested in Jamie Oliver’s restaurant and bar in the former Midland Bank on King Street built by the brilliant Edwin Lutyens in 1935. Lutyens’ Cenotaph, one of which can be seen in St.Peter’s Square, and his designs for New Delhi are echoed in the symmetry and simplicity of the Midland Bank. Although the Manchester HQ flooring was not quite as lavish as London banks, due to the Board’s concern that the northerner’s hobnail boots would take too much of a toll, there is a particular sumptuousness in the private safety deposit boxes in the basement. Put on your balaclava and black gloves and don’t leave any fingerprints on the hundreds of shiny steel plated secure boxes. These once housed jewels and paintings as well as, or so the tale post-refurbishment goes, some guns and Joy Division master tapes (not in the same box). The vault is in the basement and can be hired for party bookings, pop to the toilets and take a glance. Twenty-five storeys of Chicago inspired ‘International Style’, the Co-operative Insurance Society wanted a world class building as their HQ and in 1963 they built the tallest building in Europe, an honour it didn’t hold for long but is still a classy addition to the city’s skyline. The Board Rooms and interiors were designed by Misha Black and the DRU and more William Mitchell murals can be found inside the foyer of the CIS Tower. Maybe you could take all those old co-op stamps in and ask for your dividend. Possibly Manchester’s most unique building is the ‘Toastrack’, nicknamed for obvious reasons. Take a short bus trip to Fallowfield to see City Architect L.C, Howitt’s triangular landmark. Built as the ‘Domestic Trades College’ and latterly the ‘Hollings Faculty’ of Manchester Metropolitan University, the Toastrack is now sadly abandoned as MMU recently moved into the centre of the city. And finally, for science and engineering buffs maybe a short jaunt out to Macclesfield to see the University of Manchester’s Lovell Telescope, otherwise known as Jodrell Bank, a ‘218-foot zenith-pointing, wire-grid, fixed paraboloid’ mega Radio telescope built in 1947. It tracked Sputnik 1 and searched for America’s lost Mars Observer spacecraft as it was the only instrument able to do so. George Stephenson? Never heard of him. Buy a ukulele at Forsyth’s Music Shop – a fine selection of instruments and sheet music plus 1960s scandi-shop fittings. The Britons Protection – whisky galore!